PAMOSA, in association with PHARMACEUTICAL COMPANY Everest Pharma,using the balanced science of Ayurveda, brings to you a "Diabetic Medicine" called "DIBOWIN" FDA approved with GMP certification. Diabetes mellitus (DM) currently is a major health problem for the people of the world and is a chronic metabolic disorder/syndrome resulting from a variable interaction of hereditary and environmental factors and is characterized by abnormal insulin secretion or insulin receptor or post receptor events affecting metabolism involving carbohydrates, proteins and fats in addition to damaging liver, kidney and cells of pancreas (Baynes, 1991). In modern medicine, no satisfactory effective therapy is still available to cure the diabetes mellitus. It is apparent that due to the side effects of the currently used drugs, there is a need for a safe agent with minimal adverse effects, which can be taken for long durations. Recently, there has been increasing interest in the use of medicinal plants. Throughout the world many traditional plant treatments for diabetes exist. 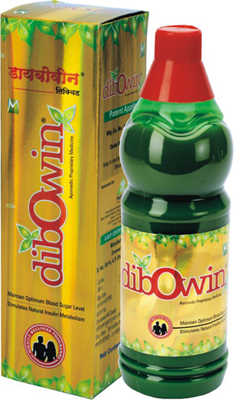 Dibowin is one such life healing Ayurvedic medicine. Ayurveda is combination of effectiveness and security and not a mere collection of herbs. In Ayurveda, a science of one principle balances the other by synergism or antagonism. Some herbs enhance action, while others avoid or minimize possible side effects. The interaction of variety of compounds makes remedies safe and more effective. Stimulates the secretion of insulin from pancreas. Helps lower glycogen levels, as well as cholesterol and blood pressure levels. Decrease of blood glucose levels and triglyceride levels. Improves glucose tolerance & brings down fasting blood glucose in diabetes. Type I and Type II Diabetes mellites. .
Dibowin being an Ayurvedic formulation is relatively devoid of side effects. After the stipulated course is completed, an evaluation should be made regarding the condition of the patient, and if desired results are achieved, a maintenance dose should be advised. One would have to continue their routine medication alongside with Dibowin till recovery is complete. There is no contraindication for use of Dibowin and unless the patient is known to be hypersensitive to any of its ingredients it may be used in any clinical setting or with any underlying disorder. In the morning empty stomach take 12 to 15 ml DIBOWIN TM with 12 to 15ml lukewarm water & after taking DIBOWINTM medicine drink half glass lukewarm water again. In the evening after 30 mins of dinner also take 12 to 15 ml DIBOWIN TM with 12 to 15ml lukewarm water & after taking DIBOWINTM medicine drink half glass lukewarm water.